These unique, crawling reptiles are aptly named after the tent-like appearance of their high vaulted shells that feature hump-like’ projections on the keel. They have one or two brownish to red dots behind their eyes; a significant marker, which differentiates them from Indian roofed turtles that have a crescent-shaped red mark behind the eyes. These turtles are small sized; the males averages 3.5” – 5”, while the females are slightly bigger ranging between 5’- 9”. The male Indian tent turtles are brightly colored compared to the females and have longer and thicker tails. Due to the pink band on the seams of their carapace, they are also known as Indian pinked ring tent turtle. They also have some pink markings on the prominent projections on the keel. Where are Indian Tent Turtles found? In line with their name, they are primarily found in Central and Northern India, Western Bangladesh, and Southern Nepal. They show a preference for large rivers such as Mahanadi, Godavari, Krishna rivers and their tributaries. 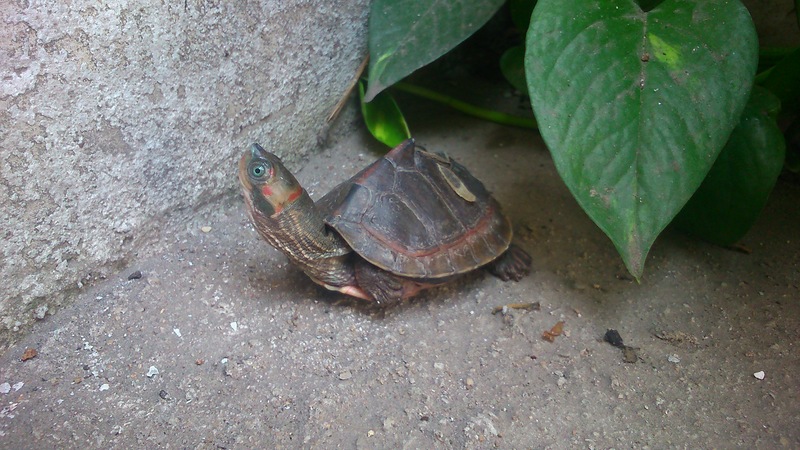 They are diurnal aquatic turtles spend a great deal of time basking on the river banks, logs and rocks during the day. Indian tent turtles are mainly omnivorous and consume a wide variety of aquatic plants and animals in the wild. As pets, their diet consists of crickets, worms, shrimps, fruits, leafy vegetables and other natural foods in addition to the commercial available turtle foods. The younger tented turtles are more carnivorous but as they grow larger and older, become more inclined towards a herbivorous diet. These turtles are especially fond of water cress, water lettuce and water hyacinth. They also exhibit a marked fondness of lettuce, kale and other leafy greens. These intelligent, beautiful colored turtles have a mating ritual in which the males seek consent from the females. The male turtles swim in circles around the females fanning their front claws until the courtship takes place. The breeding period starts in October and lasts approximately six months to the end of March. The female Indian tent turtles burrow in soft substrates to bury their fertilized eggs after mating. They lay two egg clutches in a year and each clutch consists of 3- 10 eggs, the size of the eggs is mostly dependent on the body size of the laying female. The eggs are white and elongated. The incubation period of these tented turtles varies with the climatic conditions. 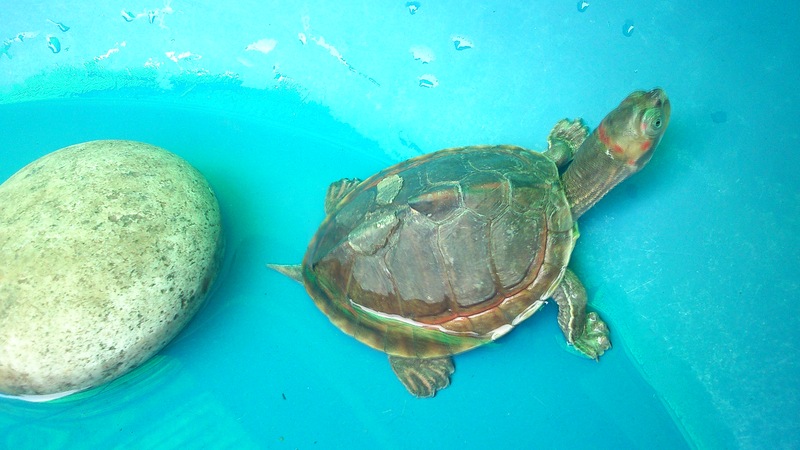 These small, palm-sized, intelligent aquatic turtles make great pets once they become attached to their owners. They are playful, colorful and do get attached to their owners. In return, they require a pond with a lot of water that is predator proofed – cats, dogs, and even kites are quite fond of turtles and must have a basking platform. If housed in an aquarium, the water should be kept clean, and the temperature maintained at between 70oF- 82oF but can be slightly higher on the basking platform 85oF- 95oF. The basking platform should be accessible to the turtle and should preferably feature a UVB light source in the absence of natural sunlight. The ideal UVB bulb (80 -100 watts) should be placed above the basking area without a glass or plastic partition for maximum efficacy in synthesizing vitamin D3.